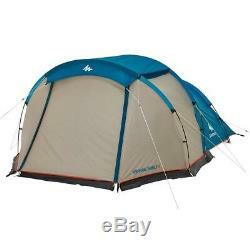 QUECHUA ARPENAZ 4 FAMILY CAMPING TENT - 4 Man. 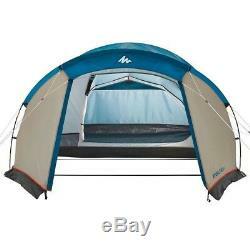 Designed for A family-sized tent for 4 people wanting a tent with a living area for sitting out of the weather. 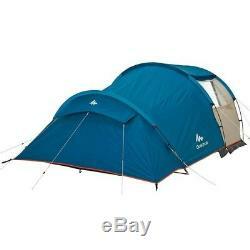 Easy to pitch, this 4 person tent has a small living area for sitting round a table out of the weather. Seated 3.9 sqm living area, 1 210 x 240 cm room. Lined roof above the living area for ventilation and to limit condensation. Resists wind up to 50km/h (Force 6): validated in wind tunnels on rotating plate. Cylindrical bag measuring 13 X 57 cm. Tested in a shower at 200 mm water / hour / m² (tropical rain) and field tests. 13x57 cm / 30 L.
Sun protection: The flysheet fabric filters out UV rays with an UPF of 30. Please note: a large amount of UV can enter through a single open door. Ventilation: Living area has lined flysheet for ventilation and to limit condensation. Wind resistance: We test all of our tents in a wind tunnel with a rotary table to expose each side of the tent to the wind. A well pitched tent with all guy ropes rigged around the tent, must remain habitable in wind speeds of 50 km/h measured near the ground (force). Waterproofing: Like all Quechua tents, special care has been given to the waterproofing, which has been verified in lab tests WHOLE TENT tested under 200 litres of water/hour/sqm! - Polyurethane-coated polyester flysheet 2000mm-- Seams sealed using thermobonded tape -140 g/sqm polyethylene groundsheet 5000 mm resistance. Dimensions and weight, folded dimensions. 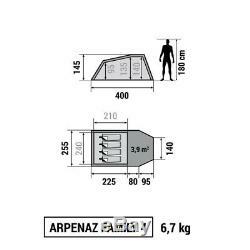 1 240 cm wide by 210 cm long room. Living area: 175 cm x 260 cm max and 140 cm min. Headroom in living area: 145 cm. Cylindrical storage bag: 26 cm diameter/57 cm long. Flysheet 100.00% Polyester (PES). Inner fabric 100.00% Polyester (PES). 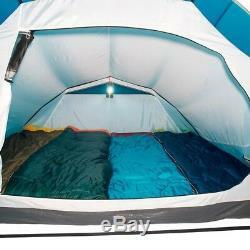 Groundsheet 100.00% Polyethylene (PE). Pole 100.00% Glass - Fibre (FG). Care instructions: Rinse in clean water after use. 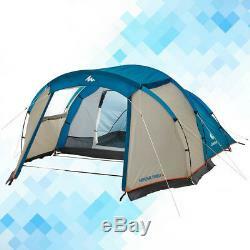 The item "QUECHUA ARPENAZ 4 FAMILY CAMPING TENT Hiking Outdoor 4 MAN" is in sale since Tuesday, July 10, 2018.